Islamabad Coprative Housing Society Ltd.
Property Blog > Punjab > Islamabad > Islamabad Coprative Housing Society Ltd. The Islamabad Co-operative Housing Society, Islamabad is registered with Co-operative Societies Department, ICT, Islamabad under Registration No.313. the well planned and scenic Capital City of Pakistan. The Society was established by a group of senior Government Officers (founder members) working at Islamabad in different Ministries / Divisions and was undertaken primarily, with the sole objective of providing to its members residential/ commercial plots at affordable prices with all modern facilities and amenities . ICHS Town is located near New Islamabad International Airport. You will certainly agree that an ideal residence is one with standard planning like wide roads. 10% Extra will be charged for Corner/Main Boulevard Plots. 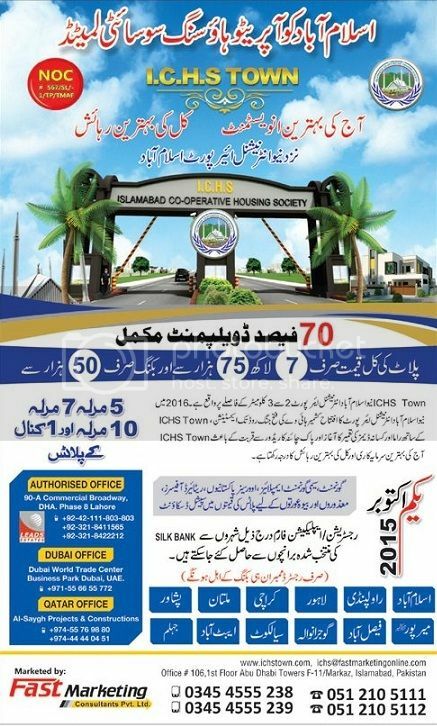 All payments must be made through Pay Order or Bank Draft in favour of Islamabad Co-operative Housing Society. Plots will be allotted on first come first serve basis. These days a lot of co operative socities have come in to existance, like ICHS, PCHS (city Gardens, Lahore), Lahore motorway city, etc etc.. I want to know which can we trust that its not fraud as these societies r not recognised by LDA/CDA etc & ur money will not be lost.